While the mainstream media has been transfixed with the Manti Te'o fake girlfriend story, it seems many outlets in the gullible liberal media were biting on another hoax, this one involving Florida Gov. 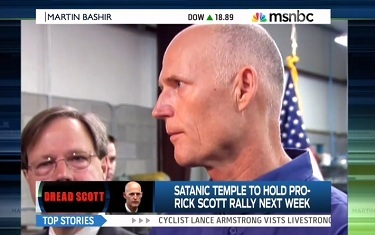 Rick Scott and a band of Satanists supposedly set to stage a rally expressing their support for the Florida Republican. "Yes, the Satanic Temple in Florida is organizing a rally next week to support Mr. Scott for signing a 2012 law that essentially would allow student-led prayer in school," Bashir explained, adding that "We spoke to one of the Satanists today about why they support the law" and that the spokesman, one Lucien Greaves, explained "that the law would prevent the marginalization of Satanism and other smaller religious groups and lead to, quote, a boom in religious diversity.'" Just a few days earlier, Bashir compared Scott to the late Communist despot Nicolae Ceauşescu, so a story like this, although too good to be true, was just too good to not run, apparently. But alas, the Satanic Temple is not a real, well, Satanic temple. Bashir's first clue might have been that there's no physical address or even mailing address listed on TheSatanicTemple.com's website. Besides Bashir, the left-wing e-rag Gawker took the bait. Ditto with Yahoo! News and the Huffington Post. As of 3:15 p.m. Friday, Bashir has not issued a correction. We'll see if he does on his 4 p.m. Eastern program today. MARTIN BASHIR: Florida governor Rick Scott has managed to alienate just about every voter in his state. In fact, he was so unpopular Mitt Romney chose to avoid him throughout the presidential campaign. And yet his administration's policies, which include purging voter rolls, drug testing welfare recipients, and warehousing disabled children in nursing homes, have shown signs of support amongst one notable but often overlooked demographic -- Satanists. Yes, the Satanic Temple in Florida is organizing a rally next week to support Mr. Scott for signing a 2012 law that essentially would allow student-led prayer in school. We spoke to one of the Satanists today about why they support the law. Lucian Greaves, and yes, that is the name the gentleman gave us, told us that the law would prevent the marginalization of Satanism and other smaller religious groups and lead to, quote, "a boom in religious diversity." Yes, Rick Scott, champion of diversity. It does seem hard to believe, but in the spirit of new year generosity, let's give him the benefit of the doubt. Because if Rick Scott even by accident is now a supporter of diversity, then we say, "Hail Rick Scott."